Simultaneously desk every type of deal in ProMax! There isn't a deal you can't put together with ProMax; whether the vehicle is new or used, whether the customer is upside down or looking to reduce their payment. Select "Retail/Lease Search" as your deal type for the payment, negative equity buyer, or both. Enter trade information, cash down, vehicle criteria and desired payment. In just seconds, ProMax will calculate and roll back thousands of lender and vehicle combinations. 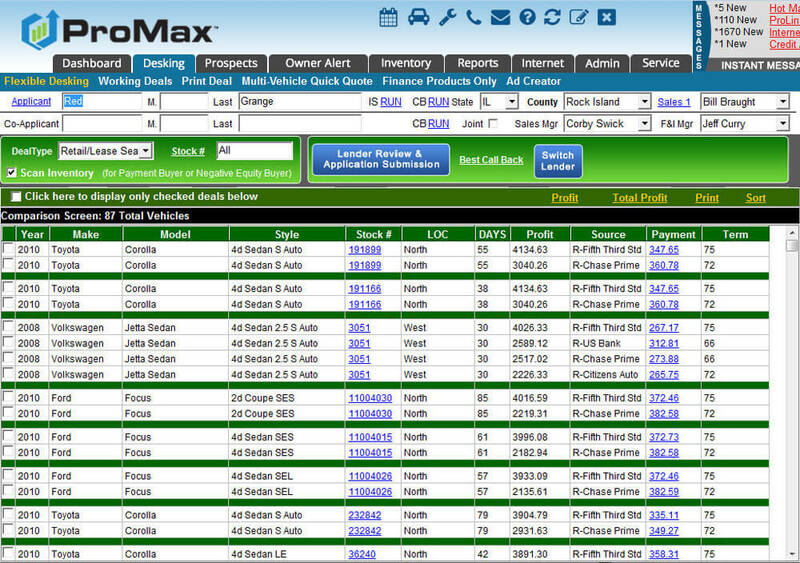 ProMax will display all options pertinent to your customer criteria, sorted by profit or days in stock. Dramatically increase your PVR and inventory churn. It’s easy for dealer groups to leverage their full inventory to identify the perfect vehicle for your customer, even if it is at another dealership. If you are part of a dealer group, change the dealership dropdown to "ALL" and have hundreds of additional vehicles available for your search. This unique functionality enables you to quote, show vehicle picture and video, and close the deal. Q: How does ProMax do this? A: By leveraging every pertinent data point specific to each customer and vehicle.